Grade II* listed Pont y Cafnau over the River Taff in south Wales is thought to be the world’s oldest iron tramroad bridge. It is also an aqueduct, with a water trough below the deck. It was an influential early prototype and is a unique survivor of its kind. 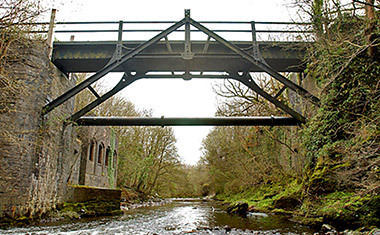 Its designer was the chief engineer of the nearby Cyfarthfa Ironworks, which it served, and it remains in use by pedestrians. The bridge/aqueduct enabled the movement of limestone on its tram rails and a water supply, both for the ironworks. The limestone came from the Gurnos Quarries, and the water from a leat supplied by the Taf Fechan. The water was used to drive waterwheels to generate power to run machinery for iron smelting. The structure was designed sometime in 1792 by Watkin George (c.1759-1822), who was not only the ironwork's chief engineer but a partner in the business too. Construction began in January 1793 and the bridge was completed some time before 1796. The distinctive appearance of the bridge is created by two large cast iron A-frames, which span the river, their raking ends embedded in the coursed rubble abutment walls on either side. The span measures 14.3m. Three transverse iron beams, at the halfway and quarter-points, connect the A-frames and support the deck. George was originally a carpenter and he used carpentry techniques for the ironwork — mortise-and-tenon and dovetail joints can be seen. King posts connect the A-frames' horizontal bracing members to the apexes of the frames, which are level with the height of the railings. The deck consists of rectangular aqueduct trough, 1.9m wide and 610mm high, made of long iron plates. The trough is covered by an iron deck, cast in sections, on which was laid the 1.22m (4ft) gauge tramroad. Wagons ran on straight iron rails carried on iron chairs. Some chairs and sleepers are still in place along the full length and segments of rail survive at the southern end. The cast iron handrails were supported at the centre and quarter points of the span. Most of the original cast iron railings have now been replaced. In 1795, a second bridge was cast from the same patterns to carry an extension of the tramroad and aqueduct from the ironworks to the Glamorgan Canal. This bridge no longer exists. Shortly after Pont y Cafnau was completed, the Gwynne Water Aqueduct (completed 1796) was constructed over the top of it. Gwynne Water was 185m long, built entirely of timber and used the cast iron uprights of the bridge for support. it supplied water to the 15m diameter Aeolus waterwheel, also designed by George, which powered an air pump for the blast furnaces. Presumably, the extra bracing that has been added to the bridge dates from this work. Nothing of the second aqueduct remains. Pont y Cafnau is a Scheduled Ancient Monument as well as a Grade II* listed structure. The iron trough no longer carries water. However, its name means "bridge of troughs", testifying to its former life. The bridge influenced the construction of other, better known, aqueducts. In 1794, Shropshire ironmaster William Reynolds (1758-1803) made a sketch of it. Reynold’s involvement in the rebuilding of Thomas Telford’s (1757-1834) navigable Longdon on Tern Aqueduct on the Shrewsbury Canal in 1796 seems to have led Telford to reconsider using stone and to opt instead for cast iron. It was also the prototype for Telford’s famous Pontcysyllte Aqueduct, which opened in 1805.